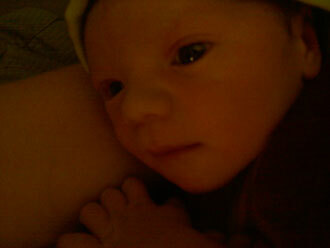 I couldn't have asked for a more perfect homebirth experience with Connie Kieltyka. She was VERY attentive and caring throughout my pregnancy, during the birth and postpartum. Connie offers a nice combination of personal and professional. I especially appreciated her knowledge of herbs, homeopathy and nutrition and her ongoing encouragement and support for me to take care of myself. 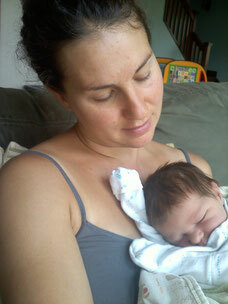 Connie's presence during the birth allowed me to feel self-empowered and safe to naturally birth my 9lb baby boy. It was truly a joyous and proud day. Connie will forever have a special place in our family. Thank you Connie for your generosity, support and care. 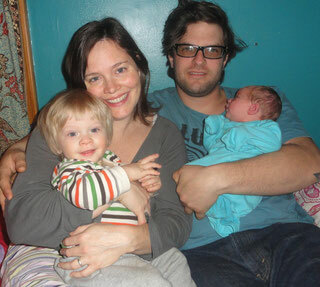 Heather, Constant, and our two beautiful boys Huck & Zephyr. 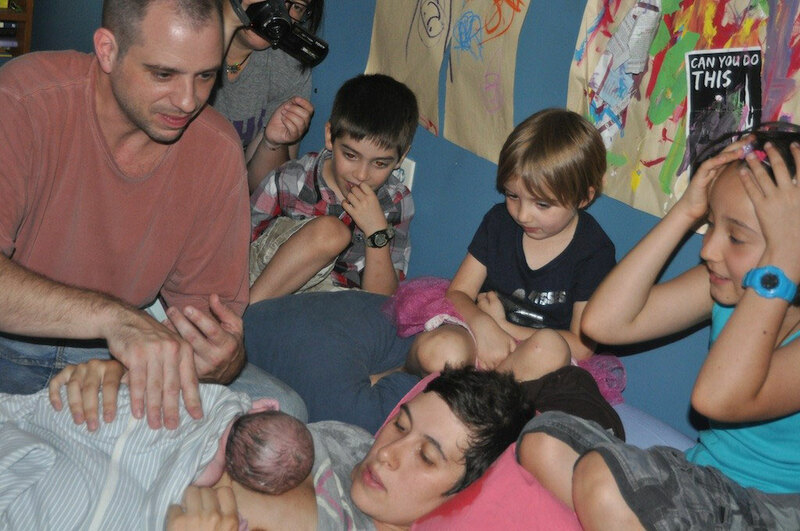 We've had 5 children and 5 different experiences working with homebirth midwives, hospital midwives and docs. We have faced the same difficult issues with each while waiting for baby's arrival and have dealt with them in different ways. Connie gave a lot of thought to things and was very clear about her own feelings and choices while at the same time respecting ours. She made really balanced decisions that seemed to pull the best choices from her own various experience as a midwife/ birth attendent. She made very well thought out and level headed decisions and that made it easy to put our trust in her wisdom. We found Connie near the middle of our pregnancy after becoming dissatisfied with the hospital model and after being turned down by a number of homebirth midwives due to our financial situation and unconventional lifestyle. Connie was thoughtful and thorough in her assessment of our off-the-grid cabin in the woods as a safe place to give birth and was willing to work with us financially. Connie said “I believe that homebirth should be an option for all healthy pregnant women.” My prenatal visits with Connie in her cozy home office always left me feeling calm and confident. They were never hurried and she was always happy to answer questions and talk through concerns. Her presence and support at the birth of our daughter was such a gift. She brought the perfect blend of nurturing energy and no-nonsense medical expertise. Her ability to integrate my partner and two of our friends into the birth process and draw out their strengths as labor support was amazing. We ended up having a non-emergency transfer to the hospital. Connie’s experience in hospitals and her skill in helping us understand our options made it possible for us to advocate for ourselves and persevere in our preference for a vaginal birth. Connie’s support during those vulnerable first days and weeks as new parents was invaluable. Her love of her work and her confidence in the female body to give birth naturally shines through in everything that she does. If we ever have another child we would definitely ask Connie to be our midwife. Connie Kieltyka's knowledge, confidence, and professional/personal approach enabled us to have the birth experience we wanted. Connie spent a great deal of time educating us along the way so we could make informed decisions about the birth and our newborn. It is so refreshing to work with a seasoned practitioner who also has a deep understanding of homeopathics, nutrition, and herbs. The result of Connie's efforts and care was a birth experience that left me feeling uplifted and proud. 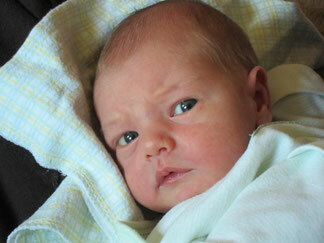 I was able to begin the process of caring for my newborn feeling strong. One day when I woke up my mom told me that the baby might be born today. I was happy. My mom, Vanessa, asked me if I wanted to come with her to see if she was dripping so we went to the bathroom and she was. So we just called everyone, “let's call Hannah (my big sister), let's call Marma (my grandma), let's call the midwife, and let's call the doula!” I was really happy. Mommy asked me if I had had any breakfast and I said no. So my mom asked Tim (my dad) to bring me downstairs to get me breakfast. March (my stepmom) said she was making breakfast for all the kids and would make me some. She made me egg salad. My mom went upstairs and laid on the bed and put a towel underneath her. 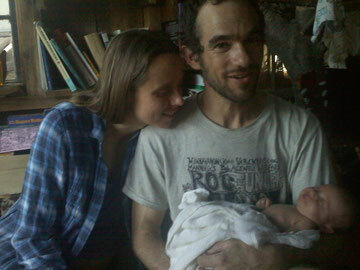 The midwife came and so did the doula, and then Hannah and Marma came. I went downstairs to tell Ava and Uly (older siblings) that the baby really was going to come. So we all went into my mom's room and waited, and then waited, and then waited, and then waited, and then waited...we played with Marma with Playmobil and we put on headbands, jewelery and sunglasses and stuff like that. And then the baby's head came out and ooooooooh, I said to my grandma Marma, that I could not look at his head because it was too gross to look at. She said it looked like a hairy mushroom and we laughed about that. Then the baby's face came out and his hand at the same time. My mom held his hand until the next contraction then she held his hand actually the whole way out. I saw that whole part it was cool. I got to come over and see him and he was sooooooo cute. Then the sac came out and I said “ewww, that's gross.” People started admiring baby Luc and then I got to hold him. He loved me and I loved him. Later that day we got an ice cream cake to celebrate Luc's birthday and we ate it on the bed!!!!!!!!!!!!!!!!!!!!!!!!!!!!!!!!!!!!!!!!!!!!!!!!!!!!!!!!!!!!!!!!!!!!!!!!!!!!!!!!!!!!!!!!!!!!!!!!!!!!!!!!!!!!!!!!!!!!!!!!!!!!! 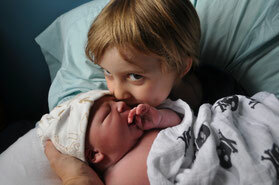 The day my little brother Luc was born, it was pretty much a normal day until 7:45. I was downstairs with my seven-year old brother Uly when my four-year old sister Mae came running down the stairs toward us and said, “Mommy says that she's having contractions and the baby's gonna be born!” Then she ran off, so Uly and I ran after her and sure enough, Vanessa, our step-mom, was having contractions. So we called Hannah, our nineteen-year old sister, and Marma, our grandma and they came. We called the midwife Val but she was at another birth so we called our back-up midwife, Connie and she came.We also called our dula Mary Riley and she came. Mae was playing with some toys and Uly kept saying, “I'm bored. When's he gonna get here?” My twelve-year old brother, Eli, was sleeping. I woke him up, but he said, “Wake me up when I have a baby brother.” My sister Hannah was taking loads of pictures and so was my mom March and everyone else. We took over a thousand pictures in his first day! He was born at 11:41am, so a four-hour labor. People were saying it was short, but four hours is a long time! They weighed and measured him. Then we had chocolate and vanilla ice cream cake, and tons of grandparents came and saw Luc! 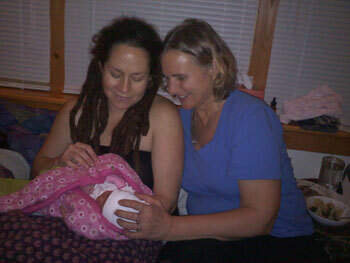 I first met Connie while attending a home birth as a Doula. Two months later I found out I was pregnant and I knew I wanted to do a homebirth. 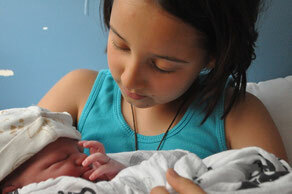 We were in the process of interviewing home birth midwives and I thought of Connie. She stood out in my mind because I remember how impressed I was with her at the birth we attended together. 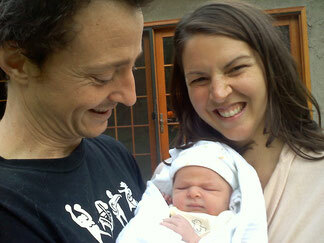 My husband and I met with her and it was clear to us that she was the right midwife for us. Her relaxed and balanced demeanor made us both feel very comfortable and at ease. Her experience as a labor and delivery nurse was impressive which made us feel like she could handle any situation that could arise. Throughout my pregnancy she provided wonderful support in and outside of the prenatal visits. Her office is cozy, clean and professional. She is very thorough and organized and provided us with a lot of information before the birth. She was there for me 24/7 via phone or email if I had any questions or concerns and was a great listener. She always gave me information on the prenatal tests prior to me taking them so I could make informed decisions. Connie also welcomed having my very inquisitive and active 4 year old son at the prenatal visits which was fun and educational for him and helped him to feel part of the process. During my labor, Connie was wonderful. She was able to naturally balance doing her job as a midwife without interrupting the natural process of my labor. I remember feeling her quiet, encouraging and grounding presence the entire time. She was positive and cheery which really helped my spirits when things felt challenging. She respected my space and allowed my husband to be part of the process and support me. Her postpartum support was also terrific. I highly recommend Connie if you are seeking knowledgable, experienced, nurturing home birth midwifery care. I want to extend maximum amounts of gratitude to Connie Kieltyka, our amazing midwife and Kim Bissell her amazing assistant, they were absolutely integral in helping Caroline bring Roscoe into this world safely and without needless interventions. Their coolheaded compassion and breadth of knowledge was inspiring to witness. 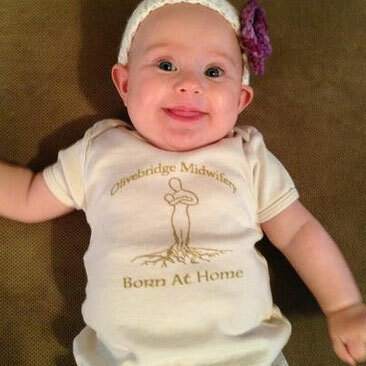 If anyone in the Catskill/Hudson Valley area are interested in home birth, look no further than Olivebridge Midwifery! 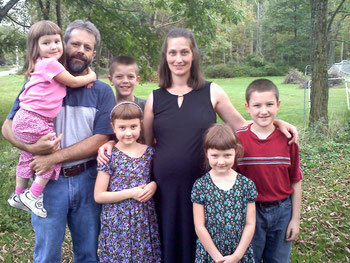 Pregnant with my third child, I meet Connie and am immediately struck by her passion, her love of midwifery. So strong is her energy for this work, you know this is what she was meant to do. This is her life’s work, her magnum opus. As my belly grows I’m increasingly drawn into her world. It is comfort like that of a sister, quiet and peaceful. This is not an immediate, loud happening but a building of trust, a growth of friendship. My water breaks, Connie arrives in her car with the “Proud to be a Midwife” bumper sticker and she’s wearing a t-shirt that says “Midwife”…both of these things delight me! There is no place she would rather be at 4am than at a homebirth. And in the space between worlds the name I call out is hers. Midwife, with woman, Connie. Thank you for all your help with the delivery and a fabulous experience! Love, John, Benedetta and Valentina!